The Eisriesenwelt Cave is the world’s largest ice cave with a total length of 42 kilometers. It is a part of Hochkogel Mountain in Werfen, Austria. This cave was created by the Salzach River which flowed through the mountain. According to the Austrian lore, this cave was thought to be ‘the entrance of hell”. Approximately 200,000 people visit the cave every year. It was discovered by a scientist named Anton Posselt in 1879. He just ventured 200 meters into the cave and the remaining part was explored in 1912 by several expeditions led by Alexander von Mork. 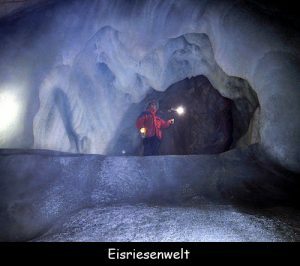 The Eisriesenwelt Cave is open from May 1st until late October every year. It is a dynamic cave which means the corridors and the crevices connect lower lying entrances to higher openings. Only initial 1 kilometer of the cave is covered in ice and the remaining part is made of limestone. The temperature in the cave remains below freezing point even in summer. Visitors can also take a cable car up to the Oedl Haus to reach the cave as it requires a 124 metres ascent. Inside the cave there is the Alexander von Mork Cathedral which is the resting place of his ashes. There is an area called the Great Ice Embankment in which you can find the largest and tallest ice growth. The Poselt Hall is the first stop in the cave for visitors where you can find the magnificent Posselt Tower Stalagmite.